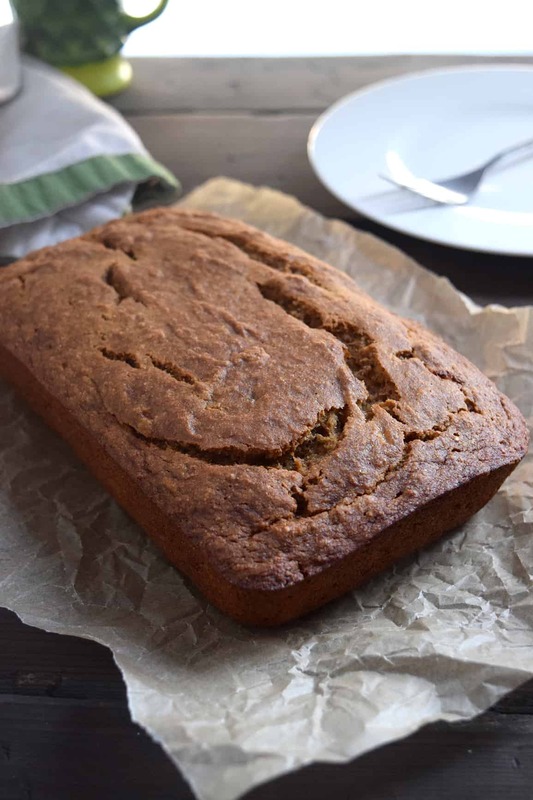 Banana bread, plain and simple. Amazing VEGAN banana bread. I’m not going to waste your time with some long, drawn out sappy blog post about what inspired this recipe. I’ll just let the pictures do all the talking. You may drool when ready! I got tired of not being able to find a banana bread recipe that was fairly healthy so I decided to take matters into my own hands. A little trial and error and…Voila! Something truly amazing. At least that’s what I think. 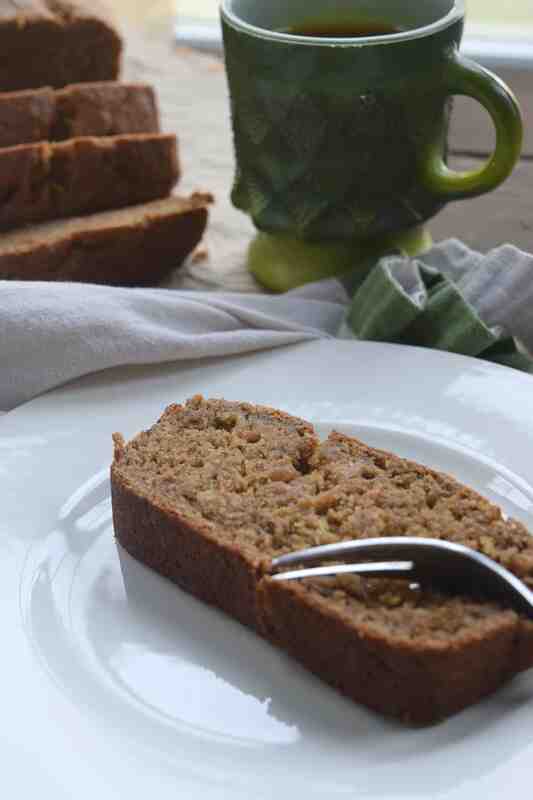 My goal was not to try and make a great “vegan” banana bread, but a great banana bread…period! I also wanted it to be good for you and I think I succeeded. 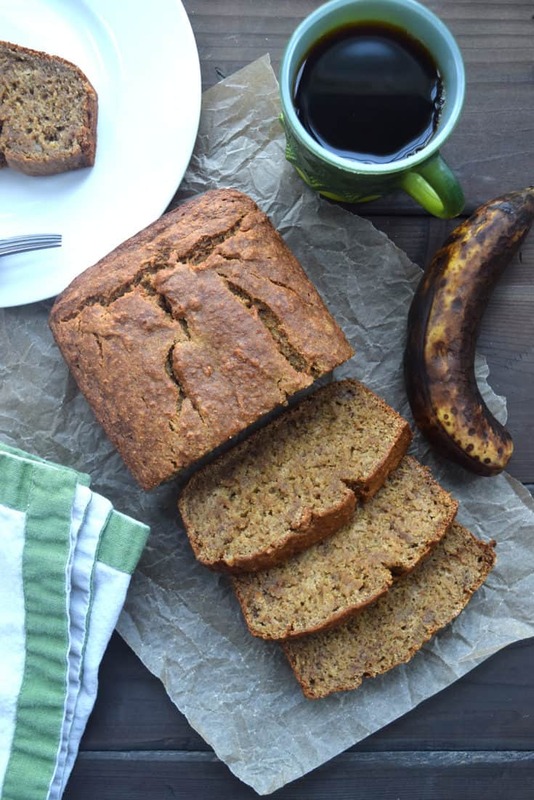 You’re not going to find any dairy, oil, or sugar in this recipe and that’s good because banana bread shouldn’t have CHOLESTEROL in it! Just replace all those bad things with a little flax, applesauce, and maple syrup. On the flip side, you’re not going to find a recipe that claims it’s healthy simply because someone stuck a zucchini in it. You don’t need any special ingredients or tools to make this bread. It’ll take you less than 10 minutes to prepare and then you just pop it in the oven. The hardest part is the waiting while it bakes. Be sure and let me know if you try this recipe! Leave a comment; then take a picture; post it on Instagram and tag the photo #shaneandsimple so I can see your dish. Peace and feast! 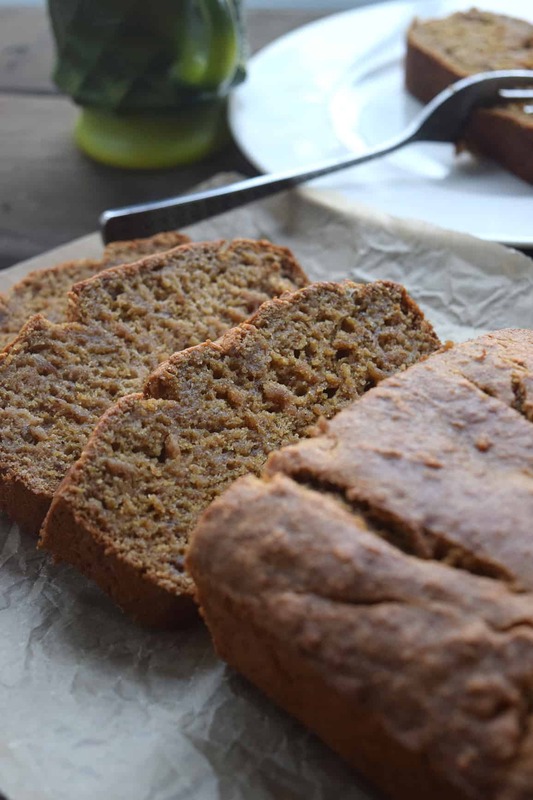 A delicious banana bread recipe with no dairy, no eggs, and no oil. Just pure goodness. SO awesome! Add the maple syrup, apple sauce, and vanilla extract to the bananas and mix well. Add the flour, ground flax seed, baking soda, and salt. Stir well until all ingredients are thoroughly combined and make the batter. 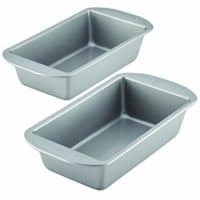 Pour ingredients into a silicone or nonstick standard sized loaf pan and bake for 50 minutes. Depending on your oven, it could take a few minutes longer. Use a tester or butter knife to insert into middle to check if bread is done. You want it to come out clean. Remove from oven and let cool in pan for just a minute then remove from pan and let completely cool. I used a standard 9x3x5 inches loaf pan. The information shown is an estimate provided by Nutritionix. It should not be considered a substitute for a professional nutritionist’s advice. Love this recipe! I added walnuts, substituted half the wheat flour with spelt flour and added cinnamon! My family loves it and my 5 year old asks for this every. dang. day. And, it’s what my 7 year old asked to take to her school class for her birthday! Jenny, this makes me smile. Love your creativity and changing things up. Thanks so much for responding…I love hearing these things! Tell your little one, “HAPPY BIRTHDAY!” Blessings. This is a great recipe! I’ve tried a few vegan banana cakes with little success but this was so moist and fluffy too. I also combined some spelt flour with walnuts and spices. Thanks very much! Sandra, you’re so welcome and thanks for reaching out. I’m happy you enjoyed it! I love the fact you added the spelt and walnuts. Nice. Awesome, Wendy! I hope you enjoy it. Please, let me know how it turns out. Blessings! this was great! added walnuts on top but otherwise followed recipe as written. thanks! Carla, so glad you enjoyed it. Thanks for reaching out! What can I use instead of apple sauce? Where I live we don’t have that. Venessa, dice 1 medium apple and blend with a little water. It should work just as well. Thanks! Have not made this yet but am surprised there’s no liquid aside from the maple syrup. Is the recipe correct? Thanks. LOL, Di! I get asked that a lot. Yes, the recipe is correct. It bakes up really well. Plan to make this when my bananas turn brown. I don’t use maple syrup or add sugars besides fruit. Do you think I could try making it with 1/2 cup of extra banana? Deana, I don’t see why not. But, I don’t think you would really need to add anymore. You could just leave the maple syrup out or add dates. Hope this helps. I have everything on hand except the flax seed. Is there anything I could substitute? . Hi, Jennifer. Yes, there are a couple different options. Try 2 Tbsp. of chia seeds. If you don’t have chia, just add half of another banana and 1 Tbsp. baking powder. It should work just fine. Let me know how it turns out. SO excited to have found this recipe. The whole family LOVES it! It’s a perfect blender recipe. Just throw it all in, blend, toss in the pan and bake 🙂 Thanks Shane! Holly, so happy to hear everyone loves it. I really appreciate you sharing it with me. Makes me ? I can’t use any wheat products but I do use alternative flours (coconut, etc) – is this okay to do when you have wheat sensitivities? I would try something like Bob’s Red Mill Gluten-free baking flour. I’ve had several people tell me they’ve used that one and it has worked the best. Hope this helps! I just made this Banana Bread…it’s so delicious!!! I have made many vegan ones and this one is the best!!! I did add a few walnuts, just had about 1/4 cup left in the pantry so I tossed them in. Thank you so much for all of your amazing recipes Shane! I also made the Beer bread today. OMG! Its amazing!! The hubster approves of both! …..SCORE!!! :). Rose, that’s so great to hear! Thanks for letting me know how everything turned out. 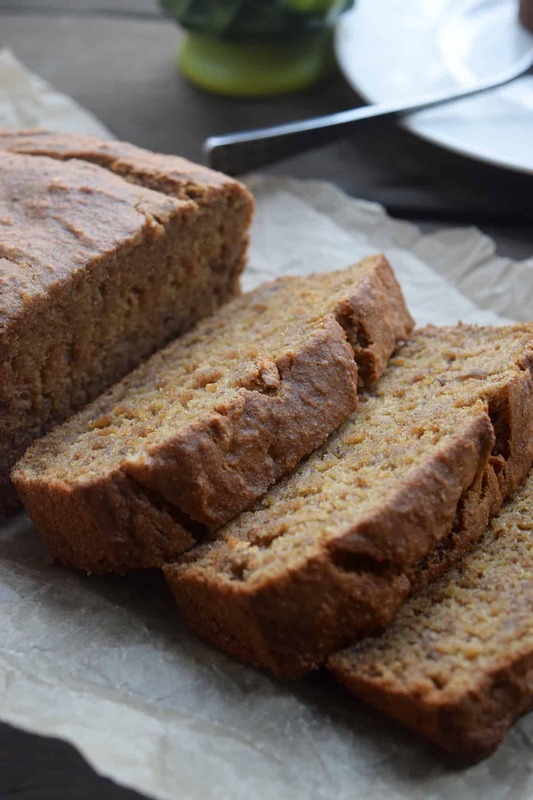 This is the best banana bread recipe ever !! First time making this and I will being using it always. My Husband loved it too ! Wow! Thanks so much Shannon. So glad you enjoyed it. Thanks for reaching out!!! Ive made many kinds of banana bread from classic recipes with eggs butter sugar to WFPB SOS free. This recipe is FANTASTIC! 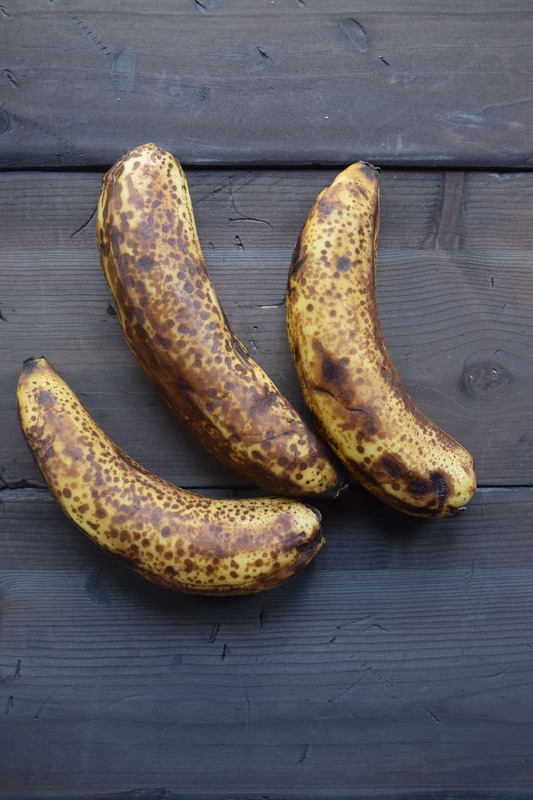 Moist delicious banana-y and really easy. I added chopped walnuts, and as a WFPB vegan, walnuts + flax pack a lot of omega 3 fatty acids!! My 3 non-vegan guests all agreed this bread is perfect! Wow, Becky! Thanks so much and I’m so pumped to hear you and everyone enjoyed it. I really appreciate you taking the time to reach out. These responses mean so much! Thank you!!! Peace. Well, it just cooled off enough to have a slice and it was WONDERFUL!! My 18 month-old granddaughter just had some and asked for more! I think because the frozen bananas were more liquidy than fresh ones would be, it didn’t hurt leaving out the applesauce but next loaf I’ll be sure to add it. Barbara, that all sounds awesome! Thanks so much for sharing and LOVE the tweaking. My goal is not for everyone to feel they have to do what I do. But, feel the freedom to explore and cook and do what works for them. Thanks so much for reaching out and I hope this helps others as well. Peace. Jan, absolutely! I actually prefer whole wheat pastry flour. Hope you enjoy it! Please say what size the loaf pan is that you used. It can make so much difference in the outcome. Anne, it’s the note section of the recipe card at the bottom. It’s a standard loaf pan, 9x3x5 inches. There’s also a link to purchase as well. I’m not the best baker! I have typically and purposely stayed away from it. But, I tried this “simple” recipe and have fell in love. My bread wasn’t the prettiest last night ?- but it tasted so darn good. I’m taking a second dab at it tonight. This time it will be perfect- I’m claiming it. Thank you so much for the great recipes. Wow, Vernita! That is so great! Good luck tonight, but remember, it ain’t go to be pretty to be delicious ? Blessings. Hi there, I just made this today and it turned out pretty good! I did make a few changes: I only put in 1/3 cup of maple syrup, no vanilla and I made 12 muffins as I do not have a loaf pan. They were silicone molds as well and it was my first time using them….they work great. I also added a sprinkle of cinnamon and a small handful of walnut pieces. I thought they tasted good but I would probably put the full amount of maple syrup in the next batch and a little more cinnamon. The muffins took about 23 minutes to bake. Thanks for a wonderful recipe! Kelly, thanks so much for your feedback. Especially, the cooking time. So glad you enjoyed them and felt the freedom to do your own thing. That’s what I hope to inspire and encourage. Blessings. So dang good! I loved it. I took it out a little early because it seemed to be done at about 44 minutes. My new favorite! This loaf rose very well. I added a couple tablespoons of date paste and it tastes wonderful. I’ll be making it again. Thanks for the recipe Shane. Love this recipe! Just put one in the oven. I love this recipe. I’ve made it several times now, and I’m making it again this morning. Thank you so much for posting it. (PS I also love to add a few chopped walnuts). Thank you! I made this recipe as muffins and they are delicious! Next time, if I want to reduce the maple syrup to 1/4 cup, should I make up the decrease in liquid with water? Thanks, Ellen and so glad you enjoyed it! You can reduce the maple syrup without having to add anything extra. Should work just fine. The only thing I might possibly add would be another banana. Could I use sugar in place of maple syrup? If that’s your preference, but I would use organic sugar. 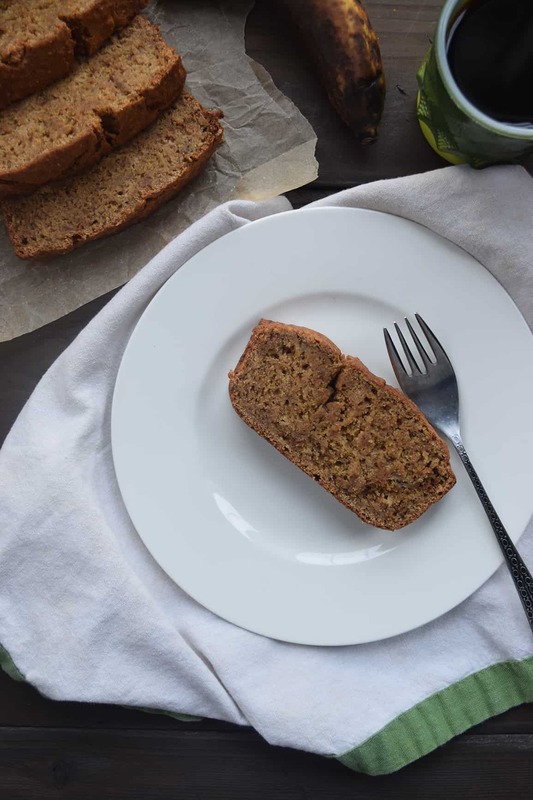 I have to say I am not usually into idea of “sweet” breads coming from country where they are always of sour taste, but after this recipe got posted in one of WFPB groups I knew immediately I have to try this! And the only thing I regret was not making this sooner! I added a bit of cinnamon and some raisins and it turned out to be incredibly delicious. Next time I’ll experiment with a carob powder. It’s also cool that this works without any addition of water. I’ve never tried it with almond flour. If you’re wanting to make it gluten free, try Bob’s Red Mill 1 to 1 Gluten free baking flour. Could I just use all purpose flour? Yes, that works. I specify whole wheat or whole grain flour because this is specifically a whole foods website. But, that type of flour will work. Just had my first piece. I was really worried when it wasn’t a batter at all and more like dough when I put it in the pan. I subbed date paste for part of the maple syrup and used apple sauce for the rest. I was worried that I really threw off the liquid content when I saw what it mixed into. Surprisingly, it wasn’t dry at all. Very moist and yummy. Next time I’ll either use the maple syrup or more date paste becsuse I felt it needed a bit more sweetness, but honestly I don’t think my family noticed. I pulled it out of the over less than 10 minutes ago. I went upstairs to get my camera and by the time I came down, there was none left 🙂 Definitely a keeper. Karen, that is so great. Not that you didn’t get a piece but the fact it turned out well and everyone liked it:) Thanks so much for sharing! Grace and peace. I made the regular loaf and one with cocoa powder added. Very yummy! Thanks for sharing your recipes Shane! You are welcome, Vicki! So glad you enjoyed it. Blessings. Wow ! Just tried this recipe and I cannot believe how delicious this is! Thank you as this will be my go to recipe for banana bread. Also can’t wait to try your other recipes asbthis is my first time making your recipes. Thank you, Tina! It’s a favorite around our house and hard to keep stocked (I have 5 kids) LOL! Blessings!!! I made this today, following the recipe, except using all-purpose flour since I didn’t have whole wheat. I hand-mixed it for four minutes. Baked at 350 for about 55 minutes in glass 9 x 5 pan with parchment paper on bottom. It had a good flavor, but turned out a bit dense, bordering on gummy. The bananas were large–larger than what those in the photo above show. Suggestions on how to make it less dense? Perhaps less banana? A bit more soda? Hey, Joe! Thanks for reaching out and glad you enjoyed the flavor. Yes, it’s naturally going to be dense and moist as some banana bread are more “cake like” thank bread like. But, you could try to use smaller bananas. Perhaps one less banana and adding a little more baking soda as you suggested. Hope this helps. Blessings. I don’t leave recipe comments very often, but this recipe deserves one. I made this banana bread for the first time last night and I’m impressed with how moist it is. The texture is perfect. My sister, who is a non-vegan baker herself, was here and tried a piece. She was amazed at how good it was. This will definitely be my go-to banana bread recipe. I made one small change…used half spelt flour… just because I had some that I needed to use up. Thank you, Shane, for sharing this. Kathy, I’m honored that you would take the time to leave a comment…very encouraging. I really appreciate it and am so glad you enjoyed the banana bread. Thanks for reaching out and sharing. Grace and peace. I’ve made this multiple times. I really love it. This week I added half cup of unsweetened cocoa powder as you suggested on FB. That’s awesome, Lucille! Thanks so much for sharing. Peace. I cut the maple syrup to 1/3 cup and made it in mini loaf pans. Very good! Almost all gone already so I will have to make another for the kids’ lunches tomorrow. I mixed it in the food processor which made it very fast and easy. A keeper! Rosmary, thanks for reaching out and sharing. So glad you enjoyed them. Hope they kids enjoy them:) Peace. Joe, thanks for your kind words. Honestly, I’ve never tried it like that so I couldn’t say for sure. It has more of a “cake” consistency than a bread. But, I say try it if you want and alter if you need to. Please let me know how it turns out and if you alter it, be sure and let me know. Good luck!!! Hello! I’m unable to use wheat. What about oat or buckwheat flour? If unsure, I’m just might give it a try! Either should work very well. Bobs Red Mill 1 to 1 Gluten free works well too. Shane, would my bread be too moist if I thaw some bananas I have in the freezer? Should be fine. We use frozen bananas all the time. Alissa, that’s so great! Thanks for sharing. Blessings. My little granddaughter would prefer muffins. I plan to add some vegan mini chocolate chips also. How long would I bake them? Bake them for the same amount of time. Sounds delicious! I am so glad I came across your recipe when I did a search for vegan, sos-free, banana bread. I made it tonight and it came out great! I added some walnuts on top just because. LOL Looking forward to trying more of your recipes. I also read your story. Wow! It is amazing! Congratulations! Thank you so much for sharing your story and recipes with us. I also like the way you write. I found myself giggling as I read the recipes. Love your “happy continuing”. Thanks again! Carol, that is so very kind. I’m so glad you enjoyed the recipe. Thank you for the encouragement and never hesitate to reach out with a question or comment. Blessings.